Remote control outdoor lighting is scarcely found in most outdoor lighting applications but it can be a convenient addition to your outdoor lighting environment. Don't let the installation process or the time and money needed to have your oudoor lights completely rewired stop you from having this luxury. You may find out that its easier to install than you originally thought. Most remote control lighting is very easy to install. The convenience factor is a major reason why anyone would decide to go with remote control lighting. It trully gives you a sense of freedom and comfort when coming home to a dark house. The piece of mind it gives you is one you cannot put a price tag on. So lets dive in and discover more about the installation process and whats involved. Even though you may think that installing remote control lighting is a big task, there are ways to make it simple and easy so anyone can do it. 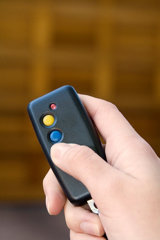 Forget about hard wiring your remote control receiver. A simple alternative is to purchase a remote control unit that allows you to plug it into whatever lighting fixture you choose. Then you can enjoy the convenience of remote control lighting for whatever type of plug-in fixtures you decide. If you decide to have your receiver hard wired, you'll be able to enjoy the convenience of remote control lighting work with your existing hard wired outdoor lighting fixtures. It doesn't get much better than pulling up to your home, pushing a button and having the lights turn-on for you exactly when you need them. Its also a nice feature for when you want to switch off your lights. Having remote control lighting assist in having your outdoor garage lighting come on for you is a big plus. Having your lights turn-on before you even get out of the car to unload the groceries is a nice touch that you will appreciate. You may even decide to have your interior lights turn on remotely with your remote control. You may never have to walk into a dark home again. The piece of mind that remote control lighting gives you and your loved ones is something you cannot put a price tag on. The intimidation of walking into a dark space is lessened so you can feel more confident about your safety since it'll be easier for you to see outdoors. Don't forget that you won't have to worry about tripping and falling on your face while attempting to carry the groceries inside. Remote control outdoor lighting is a luxury that anyone can have no matter where you live. Passing up on it may cost you the convenience and piece of mind you were looking for.